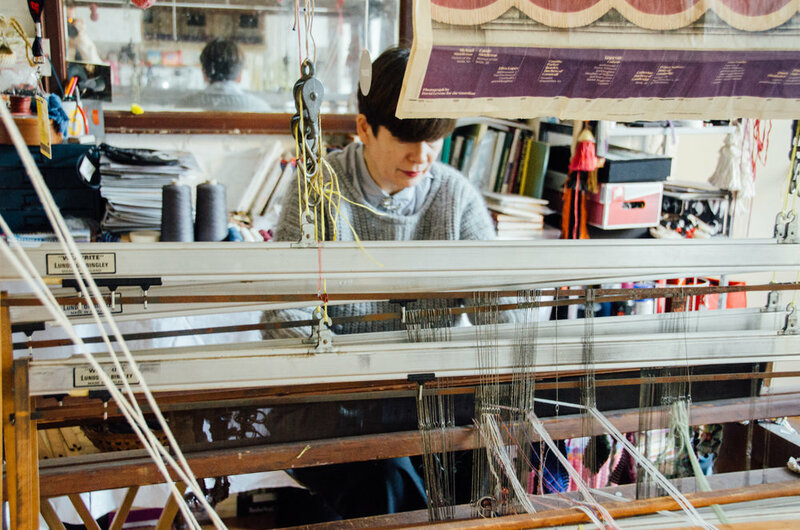 Jessica Light is the last working passementerie weaver in London. 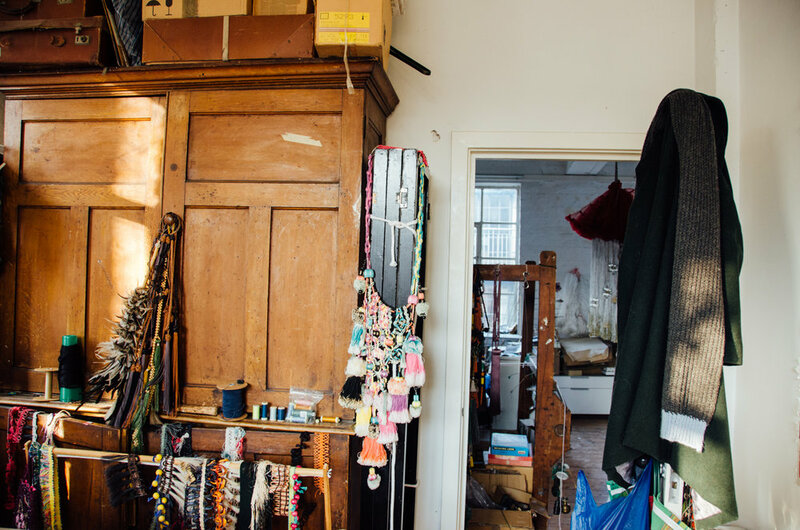 I was curious to know how you first got involved in passementerie? I studied textile in college, and one of the modules was weave, and I really loved it from the minute I got on the loom. I actually really loved the motion of weaving, and I loved the idea that with weave you make fabric almost out of nothing. It’s not like printing or embroidery where you’re doing something on a preordained surface. 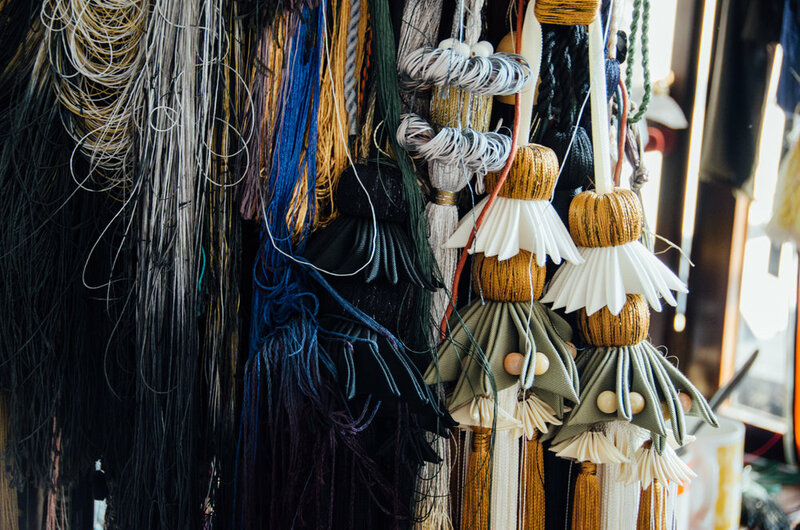 When I left college I wanted to carry on hand weaving, and at that point one of the few industries you could still go into and do things by hand was the passementerie industry. It’s a very traditional London industry as well, and I grew up in London. When I came back from college in Nottingham, a tutor suggested to me to go and talk to Wendy Cushing, who was one of three factories left in the east end of London. I went to work for her. It says in my diary actually, after my first day, “This is my job.” And twenty five years later, it still is! When you say factory…what was it like? The work was all by hand, basically all the techniques were developed for workers to be able to put these designs into production, pre-industrial revolution. It’s quite unusual to get someone who does everything.You have the weavers and then you have the people doing the table work, making the tassels, and perhaps adding embellishments to the trims. So a bit like a production line. It was all still done by hand, and it was always done in factories, but they were small. And aren’t still around anymore. No, they’ve all gone. Around the year 2000, which was when I was still working at Wendy’s, she sold to a bigger brand of company. And most of their production is done in Mexico, and they decided they wanted it to be done elsewhere, because it was cheaper. We lost our jobs, and by that time it was the last garment factory. But you do all of the different stages of the production you mentioned? I do. I started as a weaver, which still really is my first love and my first real expertise. But when I decided I wanted to set off on my own, I needed to offer everything. I was lucky because I had been working with people who worked at a demonstration speed, in particularly two wonderful ladies who liked to gossip and all, while I watched them. I learned from them, really. Yes, it is. I am the last working trimmings passementerie weaver in London now. One of about 10-15 left in this country, and it is an endangered craft. I can’t go on forever. I’m actually going to retire in a few years, and I don’t have enough work for two people, so the likelihood of me taking on an apprentice is now probably not very likely. One of the reasons I think it’s a dying thing is that I have to compete against prices from the third world, which I can’t do. London is one of the most expensive cities in the world. What I do is expensive, it’s not something everyone can afford. But another is because for a very long time, it hasn’t been fashionable. It goes back to the Huguenots, the French. They brought the techniques with them. And then it sort of took off as a trend during the industrial revolution. It’s original function was intrinsic, they had large intrinsic value. People used it because it denoted their wealth and status. Only the rich could afford it, it was an expensive item. But when the modernists came along, they hated this stuff. They saw it as frivolous, decorative, as though it doesn’t have a function. And those trends are still determining what people want to buy, that’s one thing I have to contend with. I think those are the two main reasons what it’s dying. But I haven’t given up! 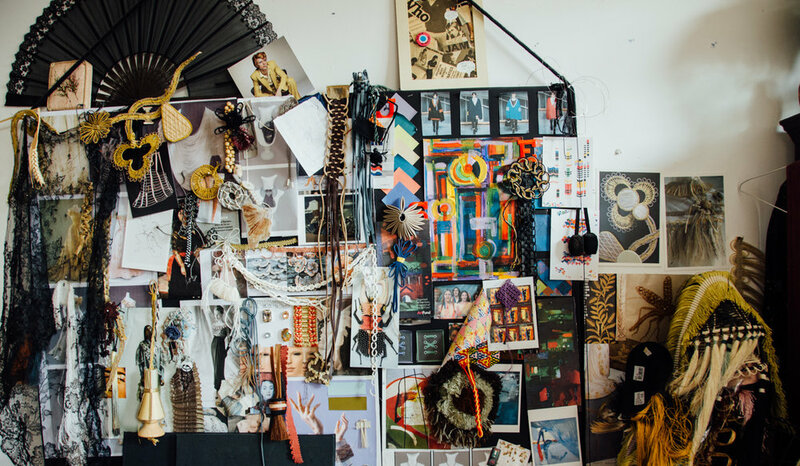 I think in order to preserve these historical crafts, you need to update them, to give them a kind of relevance to what’s going on visually within fashion and interiors. Therefore you need a new audience and a new customer base. When I came to doing this on my own, I realized to keep it going, I needed to bring new people to it, to look at it, to use it. I needed to win over the minimalists, if you like. Which I’m kind of doing, one by one, you know, they’re beginning to fall. It seems like you’ve been working with some fairly high profile designers, which I’m sure helps. I’ve been lucky, I’ve had a really fantastic career as far as being able to work with some really amazing people. I’ve worked with Vivienne Westwood, Giles Deacon. From an interiors point of view I’ve worked in the production of historical things, say, a Buckingham palace banner fringe. Most recently I’ve been working with Burberry, which is a really fantastic experience. When they did their last show to celebrate the first time they’ve done a see-now, buy-now (rather than having a waiting six months for it to come to the shop,) they created something called Makers House, where they had a lot of craftsmen who were endangered species, if you like, come in and demonstrate how they made their craft. Having a big brand behind you gives you exposure I could never do on my own, it’s really good to have that kind of support. I’m curious about your process, how do you find inspiration after so many years? My inspiration comes from everywhere, actually. I don’t look at other tassels, old tassels. I’m not actually inspired by tassels, weirdly, or trims, because I don’t like things that are too literal. I might be inspired by Mexican fashion, or abstract expressionism. Maybe by what I’m hearing, if I’m listening to South African township jazz, or looking at urban architecture. You may not see direct influences, but they’re there. Also I’m not someone who thinks, ok, I’ve hit on a style and everyone loves it, and I’m going to keep doing it. It’s always about the next thing on, not the thing you’ve done before, and I think that’s really important. I think people can get sort of typecast by their own style. We do live in a time when there’s an awful lot of appropriation. And people can see what I’m doing, so I keep one step ahead. If your work has a very strong sense of style with it, it makes it hard for people to copy you, or emulate what you’re doing. You talked earlier about bringing this old craft into a contemporary context. In terms of production, are there changes you’ve made? As far as new technology, no. I still am working with techniques going back to the 15th 16th century—if it ain’t broke, don’t fix it. It’s such a precise hand-craft, one where you’re producing multiples of the same design over and over. Do you attempt complete precision or is the slight handmade differentiation a good thing? Obviously there is such a thing as human error, but I do strive for the uniformity. I’ve always been very fast, I’m a fast maker. When I was weaving at Wendy’s I could do seven meters in an hour. That’s pretty fast. The looms were built for speed, so you could get real speed and it’s very rhythmic. I go a bit into another world. The quicker and the more rhythmic you are, the more uniform the product is. And I work as my own production line. I don’t make them individually, a tassel and then another tassel. I work on the designs piece by piece in batches, weaving, doing bindings, trimmings. I’ve gotten to a point in my career where I know what I’m good at. I’ve always had good hand-eye coordination, so some of the trims are done by eye and when I go back in and measure it, it’s almost exactly the same for each. But I’ve still put my love into it. I think one of the good things happening recently is a kind of renaissance in craft production. I think it’s a reaction to a world becoming technological and mechanized. We all live through our devices, and there is a need to return to the idea of tactile, the sort of actual doing things with your hands and connecting with the real world. That makes craft much more interesting to me.